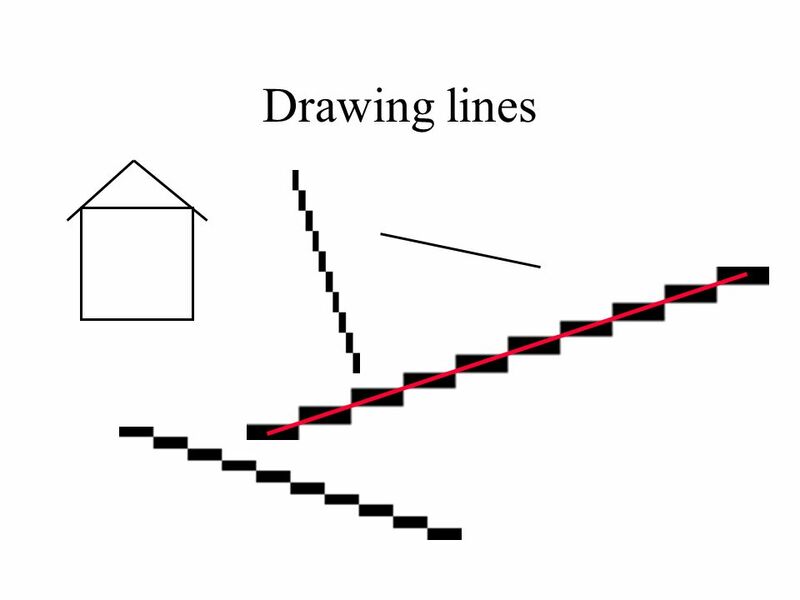 Drawing lines. 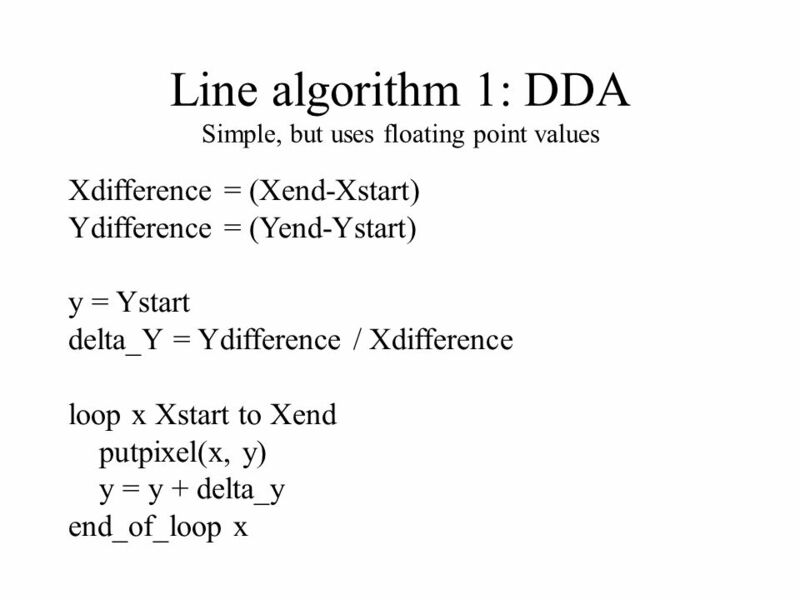 Line algorithm 1: DDA Simple, but uses floating point values Xdifference = (Xend-Xstart) Ydifference = (Yend-Ystart) y = Ystart delta_Y. 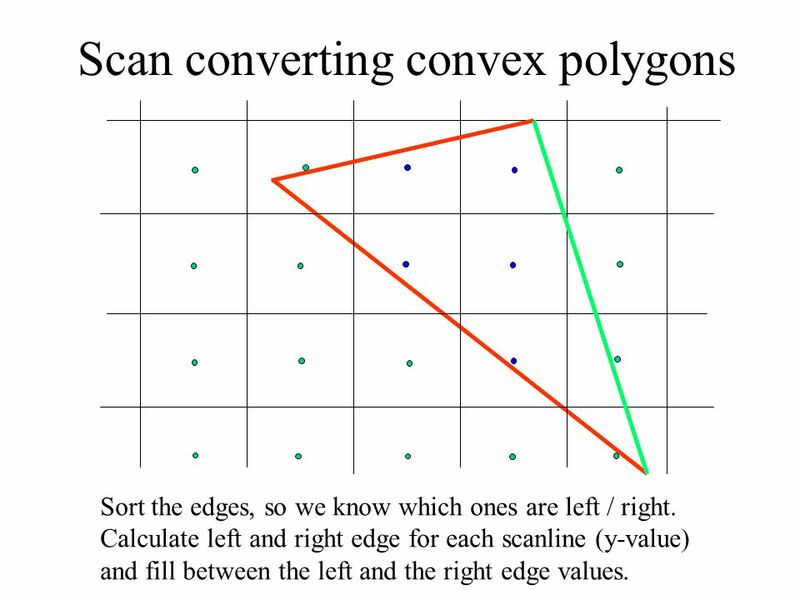 10 Scan converting convex polygons Sort the edges, so we know which ones are left / right. 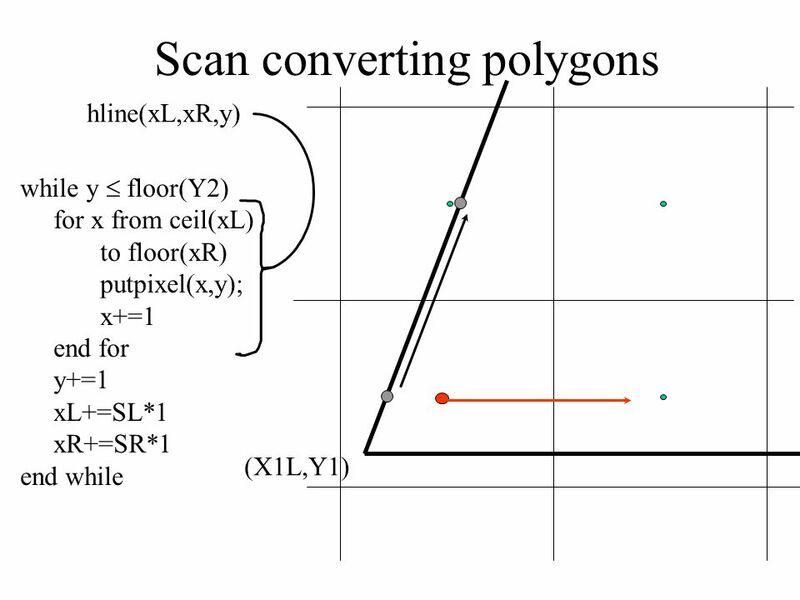 Calculate left and right edge for each scanline (y-value) and fill between the left and the right edge values. 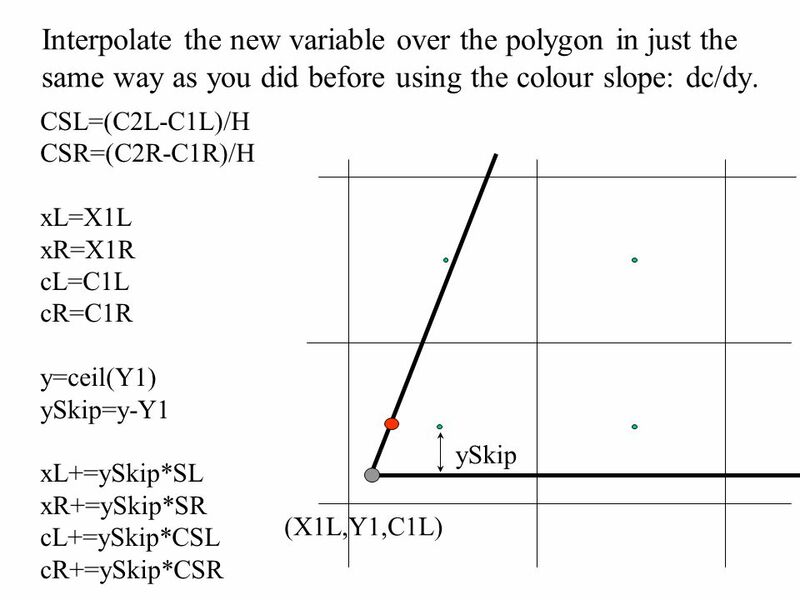 12 How to calculate the edge values? 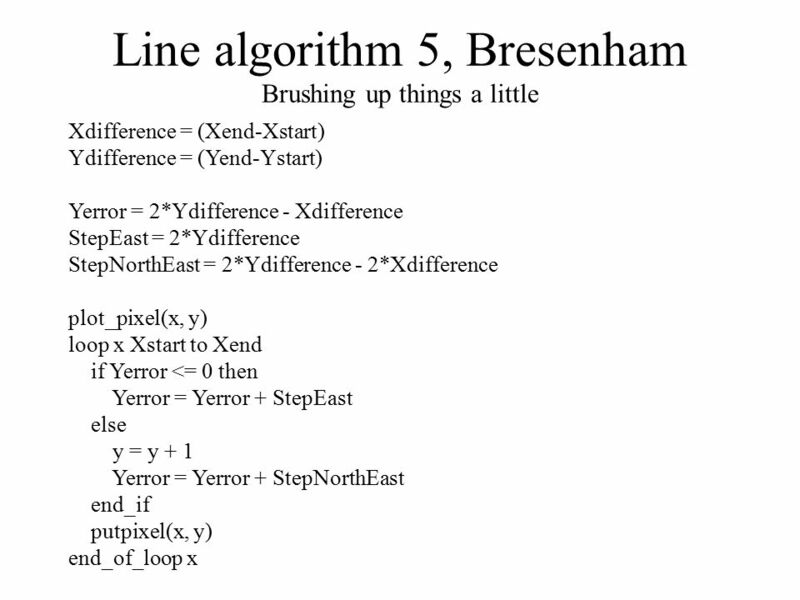 Bresenham? 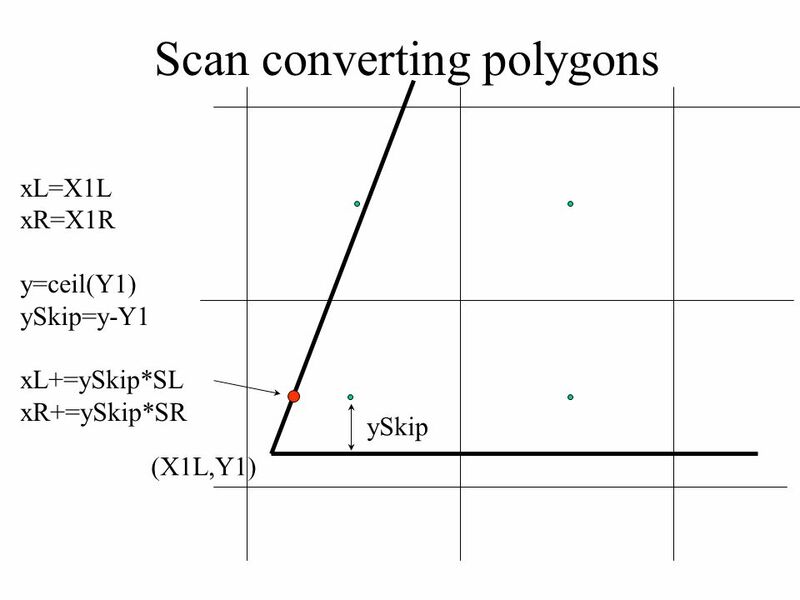 Requires integer endpoints => polygon jumps a pixel at a time when moving. 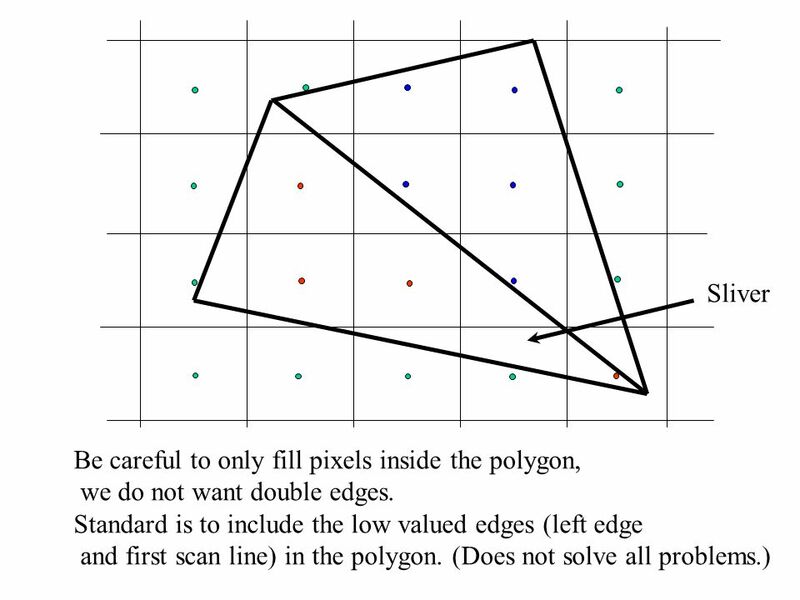 (Solve using fixed point mathematics.) 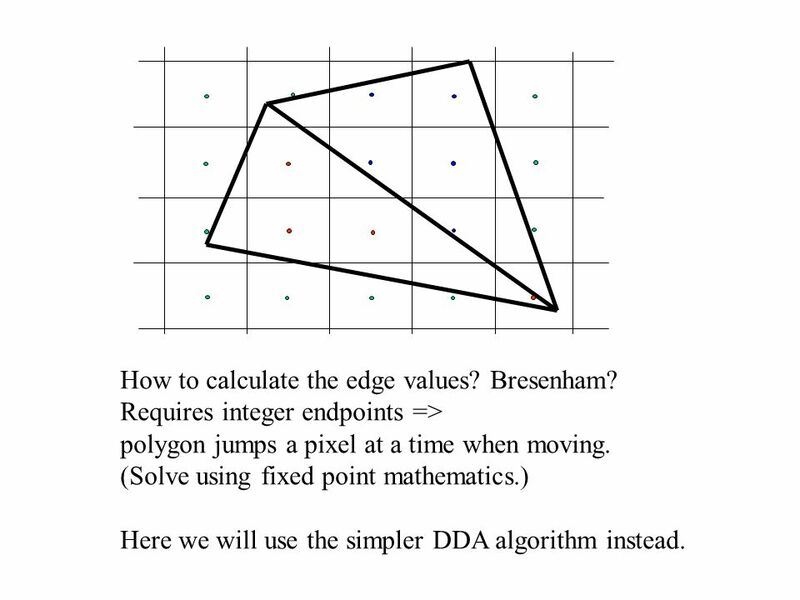 Here we will use the simpler DDA algorithm instead. 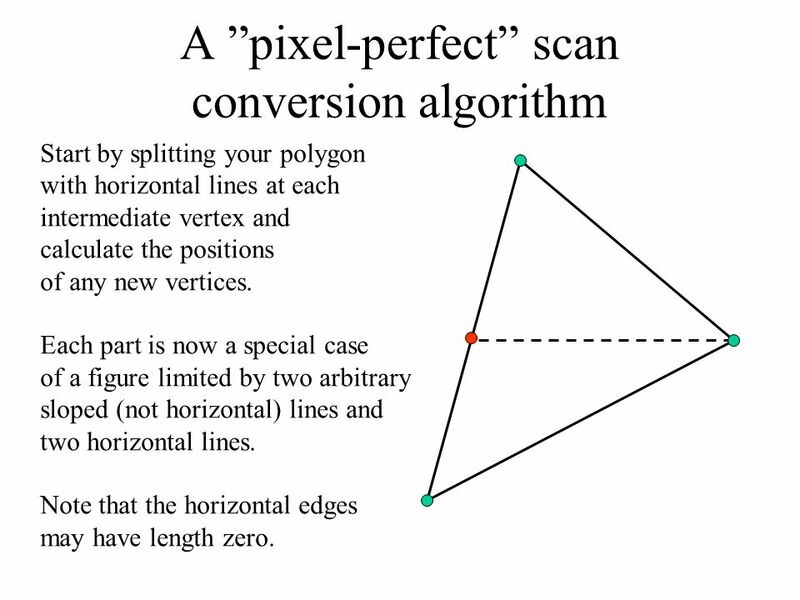 13 A ”pixel-perfect” scan conversion algorithm Start by splitting your polygon with horizontal lines at each intermediate vertex and calculate the positions of any new vertices. 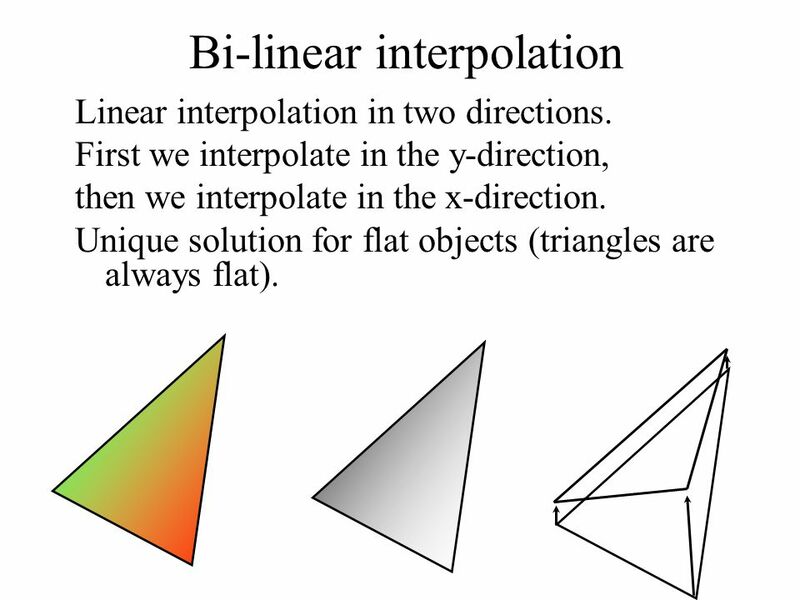 Each part is now a special case of a figure limited by two arbitrary sloped (not horizontal) lines and two horizontal lines. 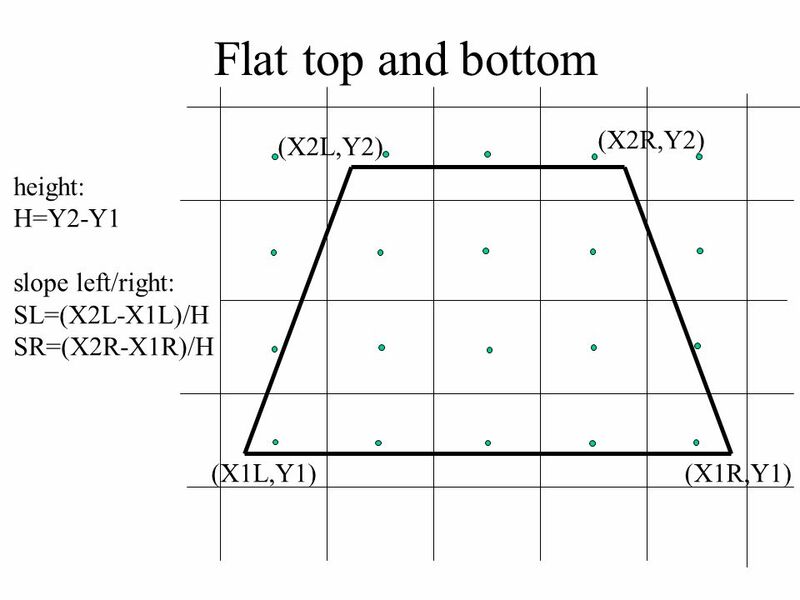 Note that the horizontal edges may have length zero. 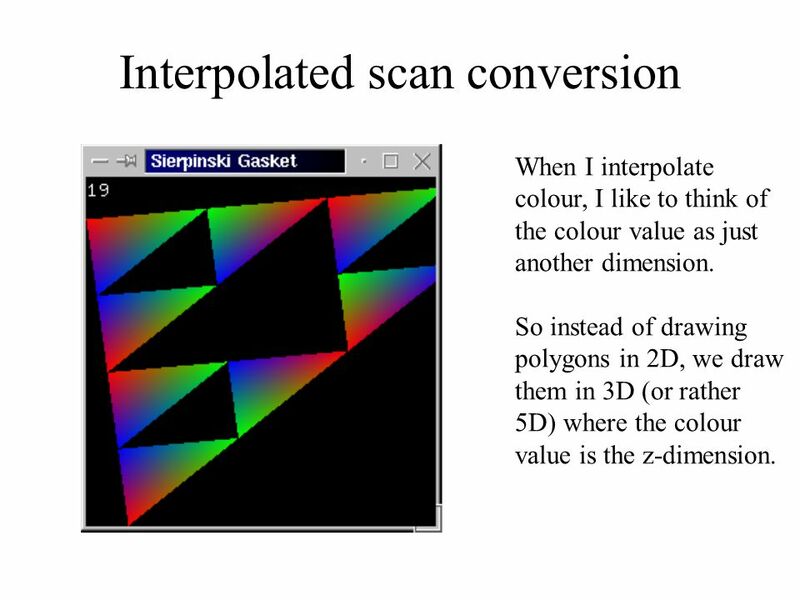 18 Interpolated scan conversion When I interpolate colour, I like to think of the colour value as just another dimension. 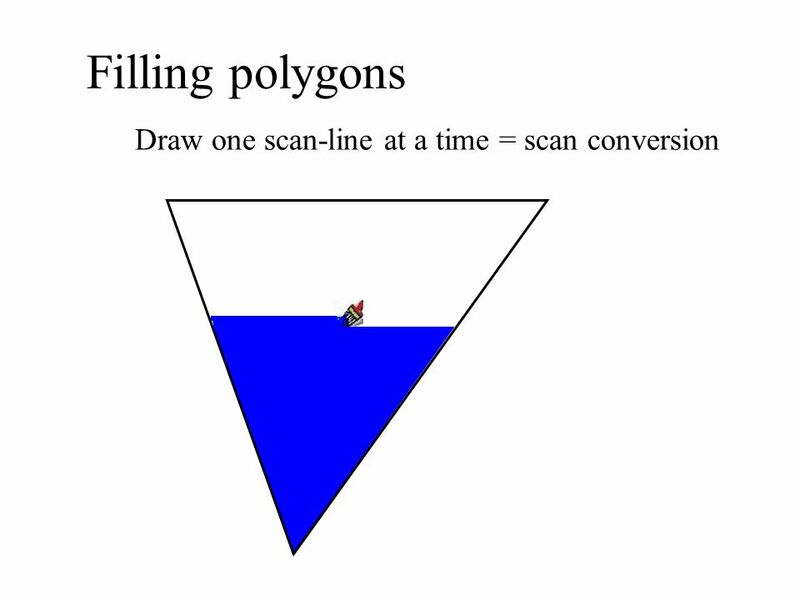 So instead of drawing polygons in 2D, we draw them in 3D (or rather 5D) where the colour value is the z-dimension. 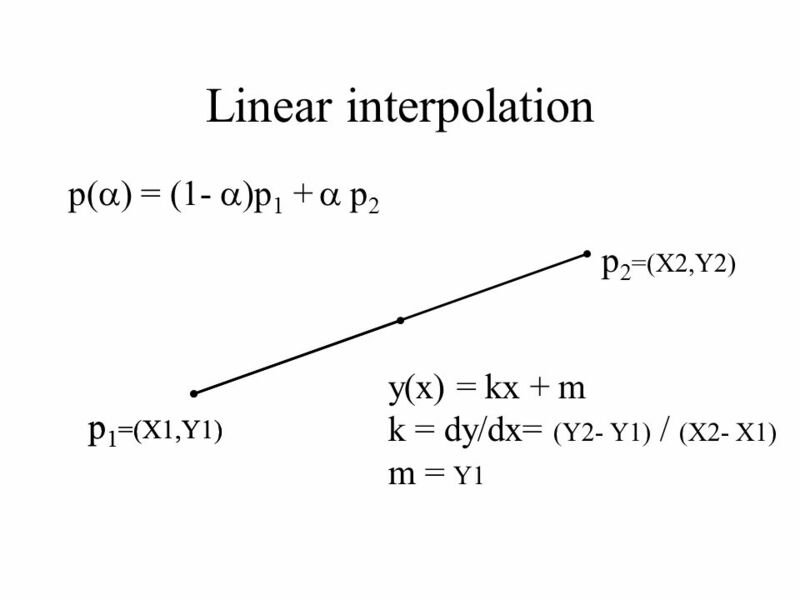 19 Bi-linear interpolation Linear interpolation in two directions. 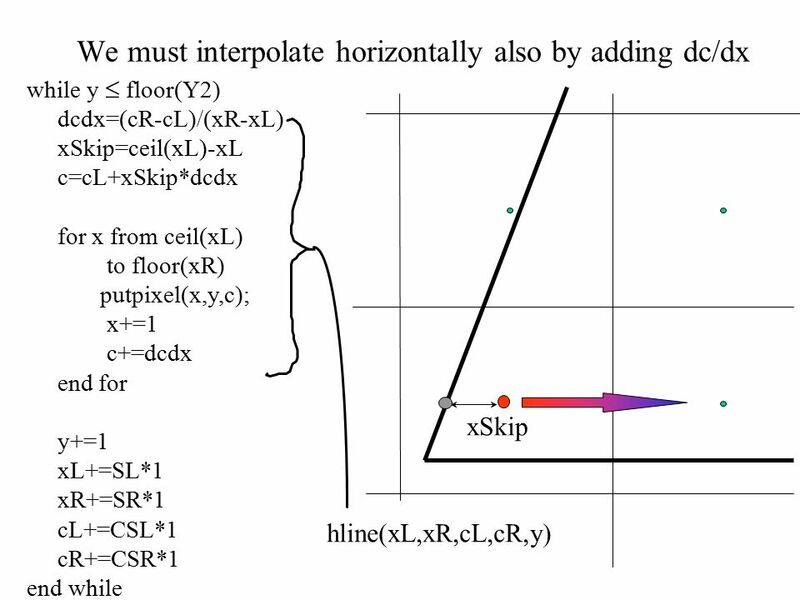 First we interpolate in the y-direction, then we interpolate in the x-direction. 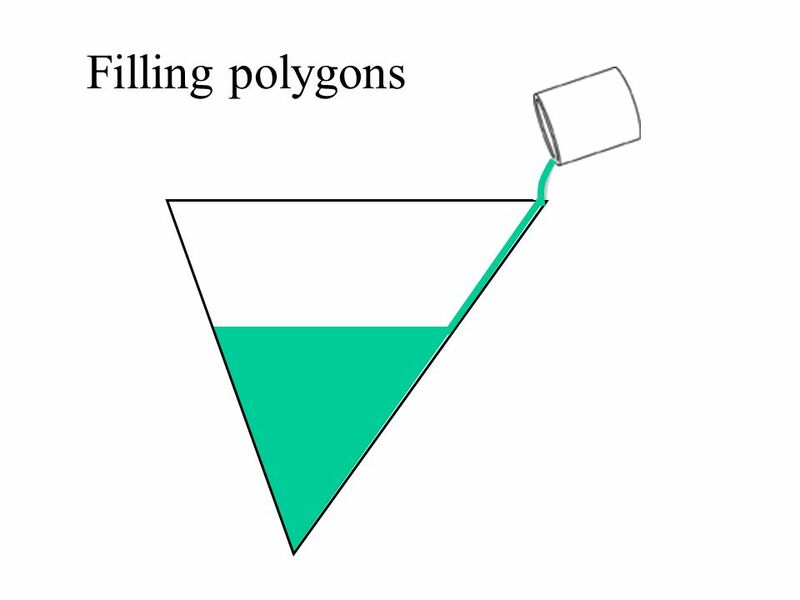 Unique solution for flat objects (triangles are always flat). 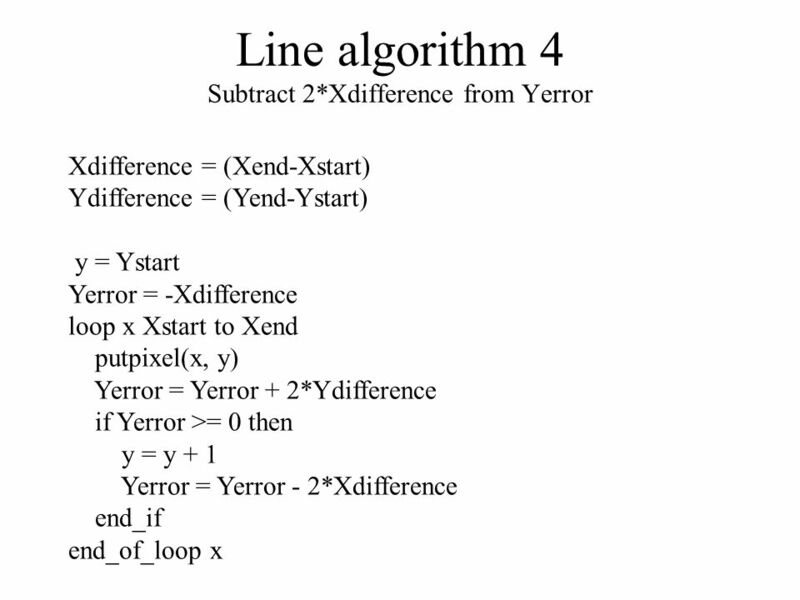 Download ppt "Drawing lines. 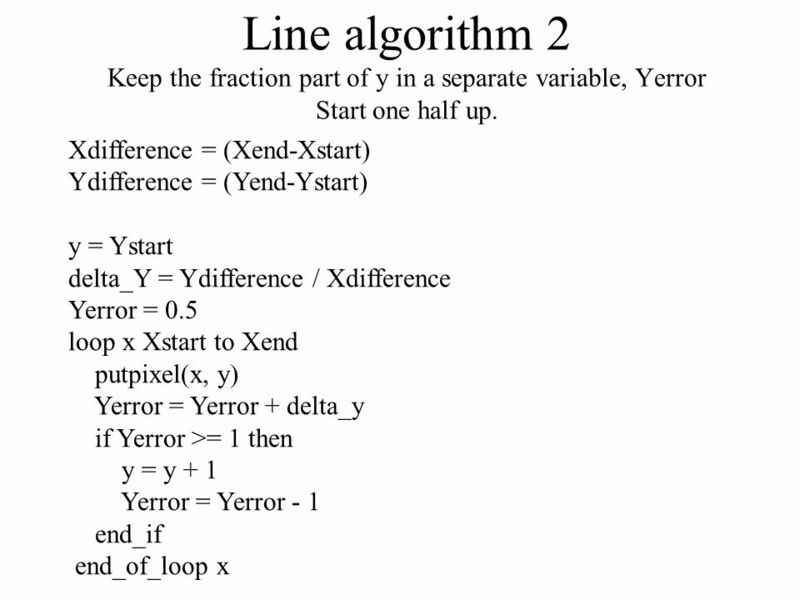 Line algorithm 1: DDA Simple, but uses floating point values Xdifference = (Xend-Xstart) Ydifference = (Yend-Ystart) y = Ystart delta_Y." 1 2D Graphics CIS 487/587 Bruce R. Maxim UM-Dearborn. 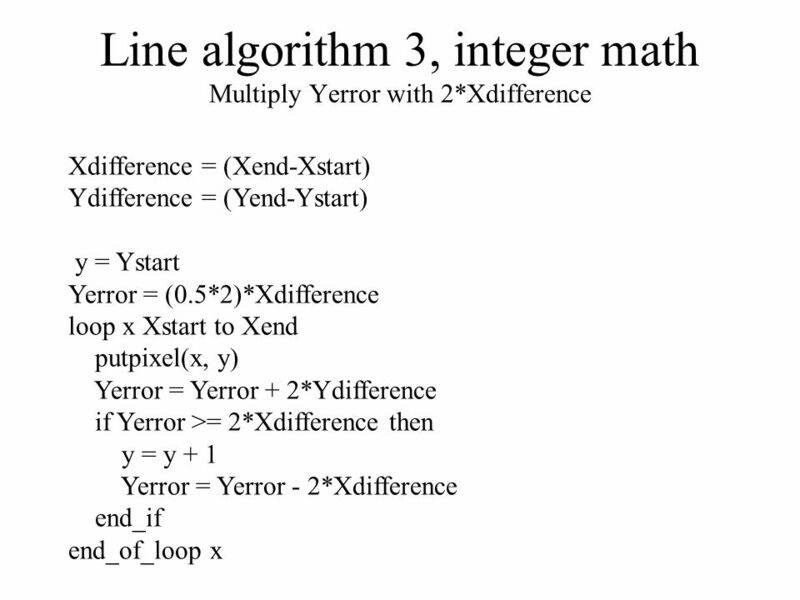 ECE291 Computer Engineering II Lecture 19 Josh Potts University of Illinois at Urbana- Champaign. 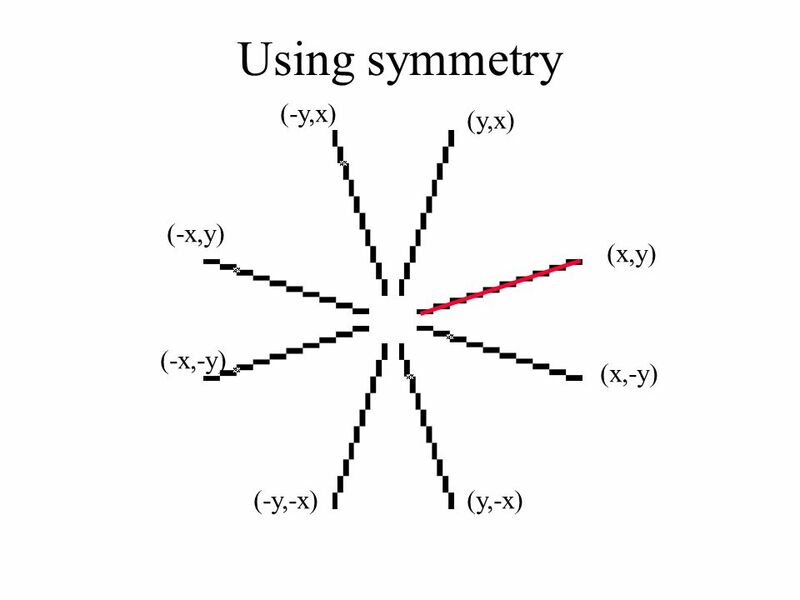 The lines of this object appear continuous However, they are made of pixels 2April 13, 2015. CS 376 Introduction to Computer Graphics 01 / 29 / 2007 Instructor: Michael Eckmann.